"MYTHICAL - On boulevard Montparnasse, find the spirit of Parisian bistros in the annexe of the restaurant Le Dôme Montparnasse. Parisian institutions, these places have seen many celebrities and have inspired artists of the beginning of the century. MARINE FLAVORS - here, one makes place for fish and seafood. In salads, fritters, carpaccio, fried, meunière, fillet or soup, the chef prepares them for you in all the sauces! For ever more freshness and the greatest delight of gourmets, the menu is renewed regularly, according to the arrivals and the moods of the chef." One of our favorite restaurants, food is expertly and perfectly prepared, service is professional and perfect, ambiance is classic and there is no noice. Dining at this restaurant is always a perfect dining experience. On y a ses habitudes, on n'en changera pas. We come back year after year. Its always exelent food and service . We really like it. My wife and I will Com back in april for two weeks . I've eaten here many times. The fish is always impeccable and beautifully prepared. Prices are reasonable, given that it's Paris. If you like fish, Le Bistrot de Dome (and not Le Dome itself, which is much more expensive and uses the same fish supply - the agglomeration includes a fish market, btw) is an ideal choice. I have always found the service to be excellent, and the welcome warm, but I do speak reasonably fluent French, so I cannot comment upon how a non-French speaker would fit in. The place fills up most nights with regular customers, and has a real neighborhood feel. If you have all three courses, with wine (all wines are 28 euros per bottle and 6.5 for a generous glass - I'd recommend the Petit Chablis), the bill will be about 60 euros each. I live in the Washington DC area, and you could not begin to get this quality of fish dinner in our area for that price. Top bistro with consistently engaging staff. Always happy for having eaten there. High quality ingredients traditionally cooked. A very good fish restaurant. And the rum baba dessert was light and alcoholic. Good restaurant but one sad thing. No soup de poisson in this season. We visit Paris regularly from London. Bistrot du Dome is our favourite fish restaurant. The fish is simply cooked as it should be with a few nice touches.This restaurant is a place of celebration and consolation when you need it. It is sehr gemutlich and friendly. I want to be there now! Excellent service - even on Saturday night with a full house - and excellent fish dishes. Highly recommended if you're in the Montparnasse area. Tres bon restaurant. À recommander sans hésiter. I love the Bistrot du Dome. All fish & all good. 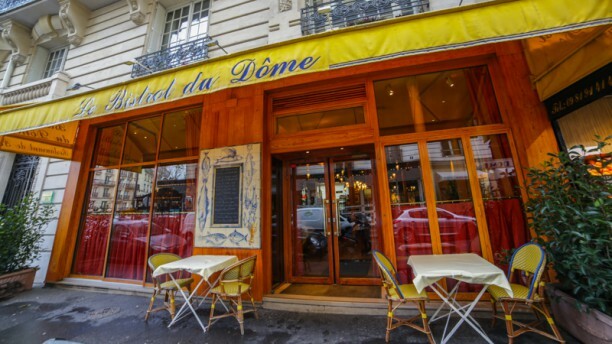 The original Dome on Montparnasse is such a touristy place, although the setting is lovely, I would always choose the Bistrot. Tres gemutlich, very friendly excellent simple fish menu. I return here regularly, highly reccomended.